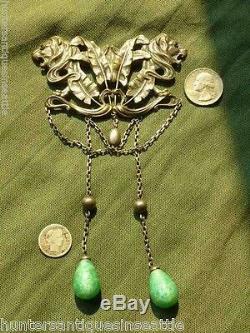 Beautiful Large Art Nouveau Double Lion Head Brooch with Green Glass Dangles. This Brooch has tropical leafs going up with Two roaring lion heads on each side with green paste eyes. This brooch is made of Nickled Brass. It has two large Green Czech Glass Dangles, hanging from the bottom. There is a makers mark on the back FN&C which I think is one of Fishel, Nessler & Co. Marks which were in New York from 1885 to about 1936. This brooch is approximately 6.5" Long by 4" Wide, and weighs 60.4 grams. We are easy to find on the Web, check out our new website! The item "Beautiful Large Art Nouveau Double Lion Head Brooch With Green Glass Dangles FN&C" is in sale since Saturday, September 23, 2017. This item is in the category "Jewelry & Watches\Vintage & Antique Jewelry\Costume\Art Nouveau/Art Deco 1895-1935\Pins, Brooches". The seller is "huntersantiquesinseattle" and is located in Federal Way, Washington.